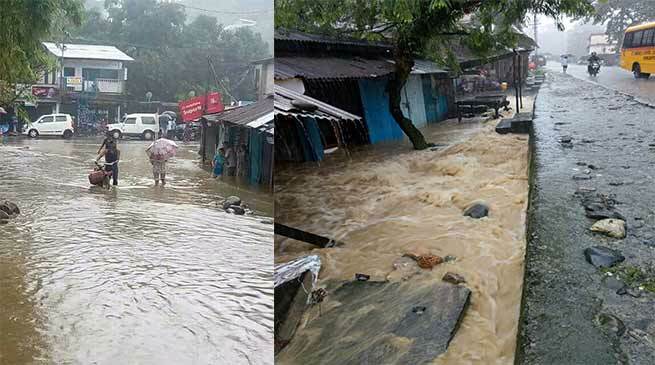 Bhalukpong in West kameng the border township due to heavy downpour since early morning many rural and urban area including Market area were submerged by rain and flood water. The main market of the town which is located near the check post was submerged due to chocked drainage system which is still to repaired even after same was experienced a month before . The businessmen and local residents of the area have to face lots of inconveniences due to heavy downpour and flash flood. Personnel from Fire & Emergency Services were pressed into service for evacuation of the man and materials of many residents which were affected by the flood. The market and petrol pump were inundated by the flood water. EAC Bhalukpong Tamo Riba declare all educational institution closed and directed all HODs to utilise all resources in rescue and restoration works. CO Bhalukpong Khoda Rakhi with the help of Police personnel and Fire & Emergency services headed by Kokir Amo and Market Welfare Committee rendered their physical support in evacuation of the people from Koilabhati, Upper Bhalukpong, Model Village, Bhalukpong Bazarline, Lower Bhalukpong. The personnel of 127 RCC with the help of man and machine cleared the debris from the Bhalukpong-Bomdila road in the township area.